SHERYL SANDBERG is chief operating officer at Facebook, overseeing the firm's business operations. Prior to Facebook, Sheryl was vice president of Global Online Sales and Operations at Google, chief of staff for the United States Treasury Department under President Clinton, a management consultant with McKinsey & Company, and an economist with the World Bank. 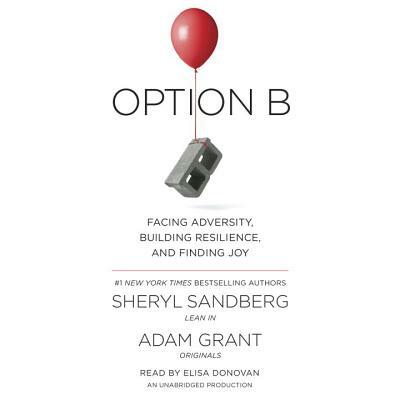 Sheryl is the co-author of Option B: Facing Adversity, Building Resilience, and Finding Joy with Wharton professor and bestselling author Adam Grant, which will be released April 24, 2017. She is also the author of the bestsellers Lean In: Women, Work, and the Will to Lead and Lean In for Graduates. She is the founder of the Sheryl Sandberg & Dave Goldberg Family Foundation, a nonprofit organization that works to build a more equal and resilient world through two key initiatives, LeanIn.Org and OptionB.Org (launching April 2017). Sheryl serves on the boards of Facebook, the Walt Disney Company, Women for Women International, ONE, and SurveyMonkey. ADAM GRANT is a psychologist and the New York Times best-selling author of Originals and Give and Take. His new book, Option B with Facebook COO and Lean In author Sheryl Sandberg, debuts April 24, 2017. As Wharton’s top-rated professor for five straight years, Adam is a leading expert on how we can find motivation and meaning, and live more generous and creative lives. He has been recognized as one of the world’s 25 most influential management thinkers and received distinguished scholarly achievement awards from the American Psychological Association and the National Science Foundation. Adam received his B.A. from Harvard University with Phi Beta Kappa honors and his Ph.D. from the University of Michigan. He serves as a contributing op-ed writer for The New York Times on work and psychology. His keynote speaking and consulting clients include Facebook and Google, the NBA, Teach For America, and the U.S. Army and Navy. Adam is a former Junior Olympic springboard diver. He lives in Philadelphia with his wife, their two daughters, and their son.